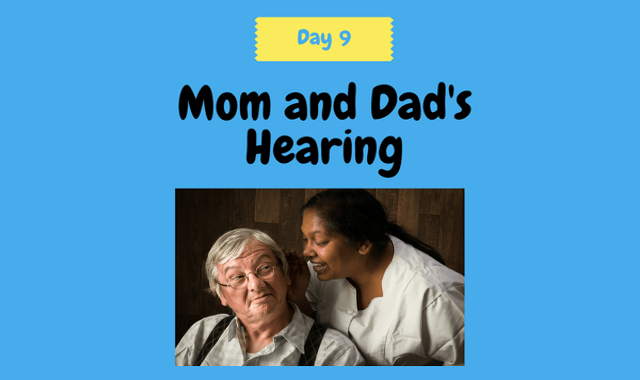 Day 9: Mom & Dad’s Hearing. When you are talking with your parents, do you tend to repeat yourself more often than not? Do you feel like you are yelling so they can hear you? Are you speaking so slowly that you end up losing your train of thought? It is possible that your aging parent could be one of 28 million Americans who suffer from hearing loss. We’ll discuss this topic on Day 9 of the 30 Day Preparation Plan To Care For An Aging Parent. Welcome to the Raising ‘Rents Podcast. This show is sponsored by ComForCare, a national home care provider that will help you live your best life possible. Day 9 of the 30 Day Preparation Plan is the next step in preparing a plan to become a caregiver. Keep in mind as we go throughout this process that our primary goal for family caregiving, regardless of circumstances, is to provide a loved one with a comfortable, caring environment in which to grow old. After age 65, one out of three Americans will at least partially lose their hearing. This is why aging adults like your parents should see an ear doctor and have their hearing checked regularly, especially if you are suspicious that there may be some hearing loss. It can be part of the annual physical. Hearing loss is not just due to aging. There are other causes such as Build-up of earwax, Chronic middle or inner ear infections, Medical conditions like diabetes or a brain tumor, High blood pressure, Exposure to excessive noise like heavy machinery, A blood clot in the nerves of the ear, High blood pressure, Tinnitus- (a common syndrome indicated by a ringing sensation in the ear), and Meniere’s Disease- (excess fluid in canals of the inner ear). The doctor will determine the cause and treat it appropriately. Some physical symptoms that may occur with hearing loss include a ringing, roaring, hissing or buzzing in the ear, also known as tinnitus; ear pain, itching or irritation; fluid or pus leaking from the ear; and vertigo. Look at people when they are talking to you and don’t shout. Begin relying on your sense of sight by installing a flashing bulb on doorbells, telephones and fire alarms. Of course, like many of the things we want to help our parents with as they age are not easy, this is no exception. Your parents may not tell you that they cannot hear because they fear losing independence. This may cause them to become isolated, depressed, angry, lonely, frustrated and even physically ill. They may then withdraw from their normal social activities, refuse to attend family and friend gatherings, or doesn’t answer the phone anymore, saying they were busy or unavailable. Any avoidance of conversation is cause for concern. Your parent may also object to going to a doctor and blame it instead on others—that they are not talking loud enough. Here is where we need to exercise our good communication skills. Instead of arguing with them or ignoring them, you can tell them that seeing a doctor may result in something simple like wax buildup that is easily treated. They may bring up expenses. It is true hearing aids are not cheap. But balancing that with the quality of life they will receive may outweigh the expense. And of course, your parents may say that wearing hearing aids are a sign of old age. But you can share with them that asking people to repeat themselves and being left out of conversation may be more of a sign of old age than wearing hearing aids. And technology has really improved the cosmetic appeal of hearing aids. And did you know that many public places including hotels, churches, museums, auditoriums, theaters, etc. provide assistive technology for the hearing impaired? A great resource to refer to in helping you care for your parents is the Better Hearing Institute. They acknowledge that convincing your parents to get their hearing checked regularly and having them come to terms with any hearing loss is not easy. Your support, knowledge, confidence and respect will go a long way for both you and your parents as they go through this and need help whether they say it or not. So that’s Day 9. Join us for Day 10 as we talk about Medicare. Thank you for listening to the Raising ‘Rents podcast. This was Episode 18. If you have any questions or feedback, please go to our website www.raisingrents.com and click on the “Contact” tab. You can also find the show notes and references to anything we talked about. Until we talk again, remember that our parents raised us, the least we can do is help raise them. Talk to you later.